In the fifth article of the ongoing series "Hum Blogistani" Saket Vaidya maps his own blog journey and ponders on the impact of blogging. Saket maintains that the phenomenon is still urban and predicts that blogging from Indian Corporate would be the next big thing. Saket is a recruiter-headhunter in the technology domain, working for the executive search division of a major Indian job portal. He has been blogging since June 2004, better known as Vulturo in the trade. Saket is an avid reader of Indian blogs and a contributor to the team-blog Desipundit. riting an article, pursuing the course of the Indian blogosphere through the times can be an exciting experience. Despite not having been an ‘early bird’ blogger, I still have a lot to remember. The past year and a half has been a period, where I learnt a lot about myself, and the world around me. Continuing the series “Hum Blogistani!" we present the fourth article of the series where Chandrachoodan dwells upon the power of blogging, its ability: to take-up causes and follow them up to the hilt. Chennai based copywriter Chandrachoodan Gopalakrishnan has been a well-known signature in the Indiblogging community. His posts almost always carry a tint of wit and humour. After blogging incessantly for about 2 years, Chandroo recently pulled the plug and bid-adieu to blogging, which he subtly hints has been “a childish attempt to be popular". But we sincerely hope he would be back. Long ago, so long ago, there lived a great person. Herman Ebbinghaus. Or not so great. I ain't debating that. Nevertheless, this person did exist. And he did do something in life. What, you might ask. Well, he came up with some thing called the Ebbinghaus Curve of Forgetting. Big, big words. Very simple thought. No matter what the subject matter is, a given piece of learning is forgotten by more than half its audience in one hour. Remember this very carefully. In exactly one hour, I will give you folks a surprise test. And we'll prove Herr Ebbinghaus wrong. That, folks, is the subject of this rather rambling piece. That blogs defeat the Ebbinghaus Theory. A blog, by its very nature, tends to keep issues and learning fresh in the mind of its readers, and by extension the society. In the second article for the series "Hum Blogistani!" we have Gautam Ghosh focusing on the subject of Business blogging and predicting that Blogging will evolve into something much more than blogging. Gautam, an alumni of XLRI-Jamshedpur is a HR and Training professional. He works in the areas of Management & Professional Development, Organizational Learning, and Knowledge Management. Gautam's other areas of interests are Organizational Development, Human Resource Development, Communities of Practice, Cross-Cultural Working, and Learning Organizations. His blog was nominated in the best Indiblog category at Indibloggies 2004. When I started blogging at Gautam Ghosh on Management, more than 3 years ago it was to use it as a tool of personal knowledge management. I was a hopeless contributor to some HR and KM e-groups and first approached a blog as a repository for all the mails that I used to send out to the groups. Soon I discovered that people were linking to me and since my writings were related to HR and Management, I was getting some little traffic from other HR related blogs. These were not desi blogs and I started interacting with other bloggers outside the country. Of course, I came across Dina and Rajesh's blogs as both are interested in KM and we interacted a couple of times. My blog has followed my career interests, so going through the posts from 2002 you can see how my interests have changed. Blogging is gradually becoming the talk of the town In India. The number of Indibloggers is steadily on the rise and talking about the numbers while we are still far off from the Chinese count of 6 Million plus bloggers, we are only better off than, Brunei perhaps. This worldwide phenomenon may still be in a nascent stage here and there might be an upper skew as well, since the average blogistani comes probably from an affluent background with good “connectivity”. Yet, in a country where bijli, sadak and paani almost always collide with the dreams of bringing Technology to everyone, there are now so many blogs you would surely need some device to calculate the numbers. 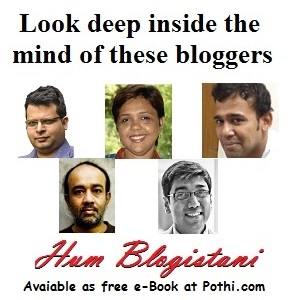 The sheer variety in the desi-blogdom is sure to startle anyone. So there are the ubiquitous techies, there are students, professional authors, journalists, researchers and there are homemakers and occasional surfers. There are gossip blogs, cartel blogs, journals, splogs, bad blogs, good blogs, good-looking blogs, shabby blogs, celebrity blogs, popular blogs, abandoned blogs, English blogs, Hinglish blogs and Indic blogs, blogs as vivid as our country itself. Given all this and since it is the Indibloggies we can take the liberty of doing some introspection here. As they say, mauka bhi hai aur dastoor bhi! Staring today Indibloggies features a short thought-series called "Hum Blogistani!" where various bloggers would do a guest-post for the Indibloggies with their views about the Indi-blogosphere, evoking its journey so far, probably doing the SWOT analysis and predicting the road-ahead. And who else but Amit Varma of 'India Uncut' to do the kickoff. A couple of days ago when Debashish asked me to write this piece, the first of this series called “Hum Blogistani,” I was intimidated at the thought. The subject – the Indian blogosphere – is rather vast, and I wouldn’t know where to start on a piece of that sort. One can’t contain an ocean in a thimble, and so on. Also, I’ve been blogging for little more than a year now, and India Uncut, my flagship blog, is not even a year old. But it has been an enormously enriching time for me, and I thought I’d write about some of the things I’ve learnt, from a thimble point of view. When I started surfing Indian blogs, the first thing that struck me was the diversity I encountered. Most non-bloggers think of blogs as just online diaries, which is a ridiculously narrow view of blogs. I often have to remind such people that “blogging” is as wide an umbrella term as “writing.” A writer can write novels, short fiction, political tracts, history, opinion pieces, reportage, travellogues, poems, promotional fluff, erotica and diary items. Bloggers can blog their way through the same areas, though with more flexibility (as I’ve elaborated here, in the context of journalism). And Indian bloggers cover all these areas and more. There is one huge difference between writing in the traditional sense and blogging, though: anybody can find an audience by blogging. Many talented writers who have the potential of building relatively small, loyal audiences cannot do so in print because the costs of publishing are high, and publishers are averse to taking a risk with them. But there are no such entry barriers for bloggers. It costs only the cost of internet access to blog, as there are plenty of free hosting sites and user-friendly blogging software available. I’m pretty hopeless at tech stuff, and Blogger and Blogspot work really well for me. As a result of this, many writers who would otherwise not break through into print manage to publish themselves and find an audience. These audiences may often be relatively small, but so what? There is a satisfaction to having a readership that may be geographically spread out, and that you wouldn’t have had access to before blogging was born. Blogging helps people reach out, and I can’t emphasise enough how rewarding that can be. While blogging is thought of by many as a solitary activity – one person and a computer – it has enlarged my social life in ways I never expected. That is something that many other bloggers have experienced as well. As we write our blogs and read those of others, we get in touch with people we share interests with, and mutual respect often turns into friendship. I have made friends I haven’t yet met in the flesh, who are a continent away, and this would not have been possible to anything like the same extent ten years ago. As I wrote here, this is quite the most rewarding aspect of my time as a blogger. But blogging is about a lot more than social networking: it can also be a tool for social change. Blog readerships in India are too low for that now, but as internet penetration in India grows, more and more people will become aware of blogging, and more and more people will blog. Readership will expand massively, and blogs will actually be in a position to influence events in the real world, or meatspace as some of us call it. In addition to the prediction I’d made in this post, I’d like to make another one: the most influential Indian blogs of the next ten years will be those written in Indian languages. Most of India does not speak English, and for too long the elites have condescended to them. This will change. As internet access becomes ubiquitous, more and more people will want to read content in their own languages. And while the regional papers, set in their fixed ways, will largely disappoint them, bloggers will not. Language software today is easily available and easy to use, and a whole generation of free thinkers and fearless writers will emerge. They will write in Hindi, Bengali, Tamil, Telugu, Marathi, Kannada, Malayalam, Gujarati, Urdu, Oriya and every other language and dialect of this country. They will reach out to an audience of hundreds of millions of people, not the mere tens of thousands we bloggers in English have access to right now. They will truly do what some us vainly and bombasticly speak of sometimes: they will change the country. It will take years, but it will happen.